Mercedes Fenerty Delahoussaye, age 88, passed away peacefully Friday March 8 at her home in Metairie surrounded by her family. She was a native of New Orleans and the daughter of Martin William Fenerty and Willie Belle (Mary) Wilson Fenerty. As a teenager her family moved to New Iberia, LA where she graduated from Mt. Carmel Academy as valedictorian. In 1950 she married Rene Francis Delahoussaye and they resided in New Iberia until 1968 when his job brought them to Metairie. "Momie" was a true New Orleans lady. She was always ready for a dance, concert, parade or a party. 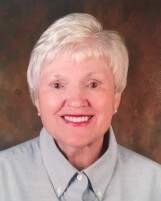 She was a volunteer at East Jefferson General Hospital for over 25 years and spent many hours, days and weeks babysitting her grandchildren and accompanying her family on vacations. She was preceded in death by her husband, her parents, her brother Darryl and her granddaughter Robin Freyder. She is survived by her brother Martin W. Fenerty Jr, her sons, Rene’ (Tonda), Keith, and Dwayne “Joey” (Kay), daughters Denise Townsend, Karen Freyder, Nannette Davis (Willie) and Dorothy “Dot” (Jimmy) Bonnot. Her grandchildren Yvette Subramanian, Monique Nolan, Valarie Welton, Ben Townsend, Jeffrey Freyder, Melissa Dugan, Christopher Freyder, Keith Delahoussaye,Jr, Amy Robert, Briana Dey, Austin Davis, Melissa, Jennifer and Cody Taylor, Ross, Graham and Scott Bonnot. She is also survived by 20 great grandchildren. A memorial service will be held on Saturday March 30 at Tharp Sontheimer Tharp Funeral Home at 1600 Causeway Blvd. in Metairie, LA. 70001 Visitation will be from 11-1 with a prayer service to begin at 1 pm. In lieu of flowers please make donations to the Crohn's and Colitis Foundation or to the Christian Brothers Retreat Home in Napa Valley California.